News and Photo Tour: The Downtown Disney Marketplace Starbucks is Now Open! 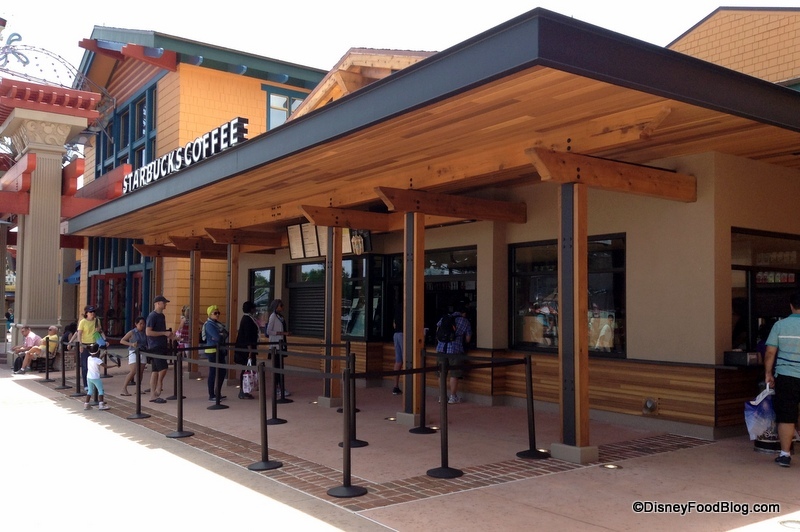 So, we thought we’d give you a quick glimpse at the newest java stop in Downtown Disney… the Marketplace Starbucks is open and ready for business (with another one coming to the West Side soon). Let’s have a look! 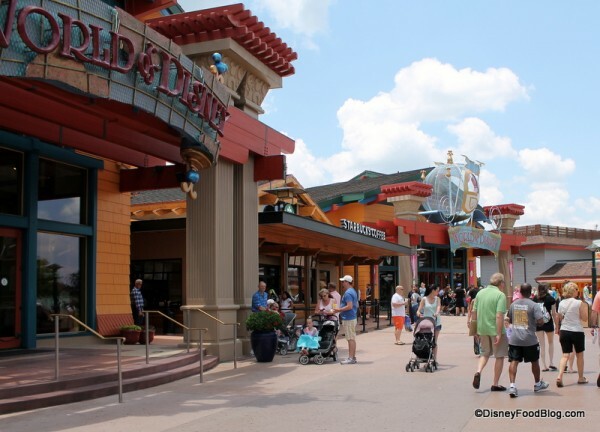 You’ll find the location tucked in between the front entrances into the World of Disney store. 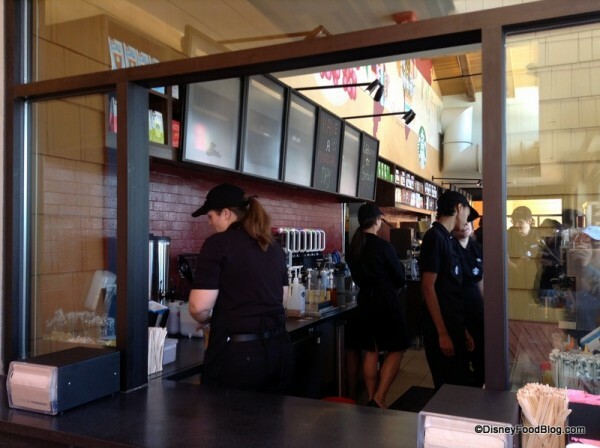 The first thing you’ll likely notice is the Starbucks Coffee signage in front of the signature green siren logo. 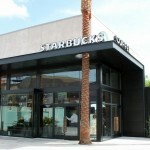 The A frame mirrors those of the entrances to the store. From that point, what you see is what you get! 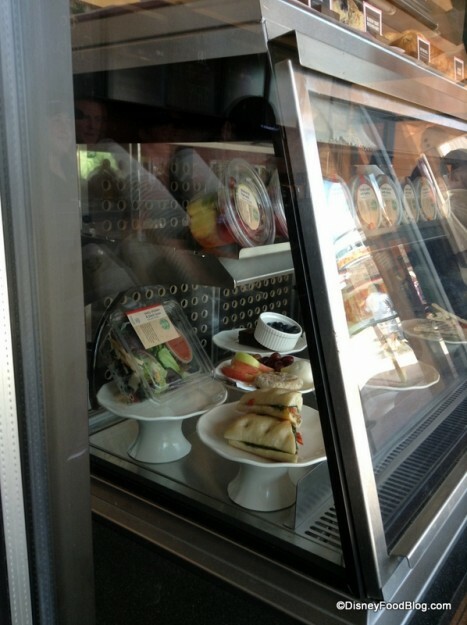 This location is walk-up only, with no seating other than the regular tables around Downtown Disney. This is a spot for grabbing your beverage and continuing your stroll. 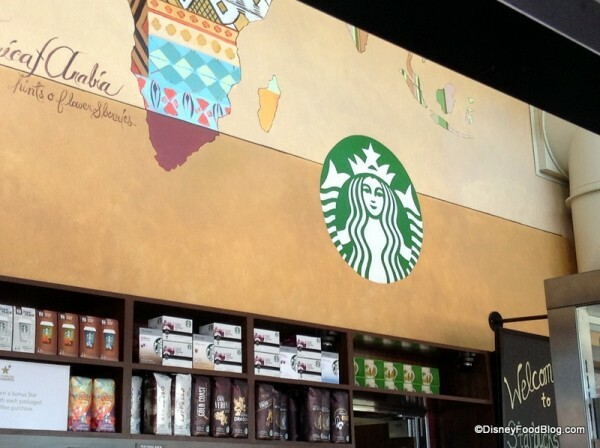 Speaking of beverages, all the Starbucks favorites are here… as well as some of that new “Oprah Chai” you may have heard about. Anyhoo, there is also an assortment of standard Starbucks snacks, including pastries from the new “La Boulangerie” line of treats that may have made it to your local store. … then pick up your beverage on the side. After that, you’re all set to visit the rest of the shops and restaurants, with a little caffeine boost to help you along. While that’s the basic gist, there are a few cool details to share. Only viewable from the ordering area, there is a colorful mural near the ceiling displaying the earliest stages of a coffee bean and some of the regions from which Starbucks sources their coffee. I thought the painting of the coffee beans in their earliest red stages held some prime real estate for a Hidden Mickey. While there isn’t an obvious one, I think I might have spotted one there on the right. 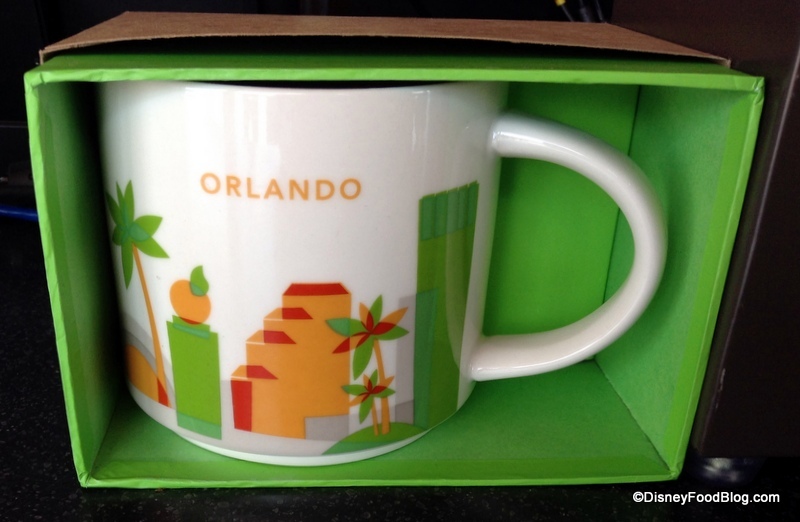 Here’s a fun find… for those who collect the Starbucks state/city mugs in your travels, you can find the Orlando mug here. While the location is all Starbucks, for sure, the staff (super pleasant, by the way) makes sure you never forget you’re at Disney World! And with that, we wish you a magical (and caffeinated) day as well! 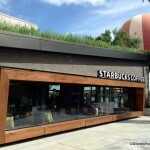 What do you think of the latest Starbucks stop in Downtown Disney? Please let us know with a comment! I’ve heard that at the MK location any size beverage is considered a snack credit. Is it the same at the DTD location? Wow…it looks so modern. Does anyone know if you can use gold rewards (like free reward drinks or free refills of coffee)? 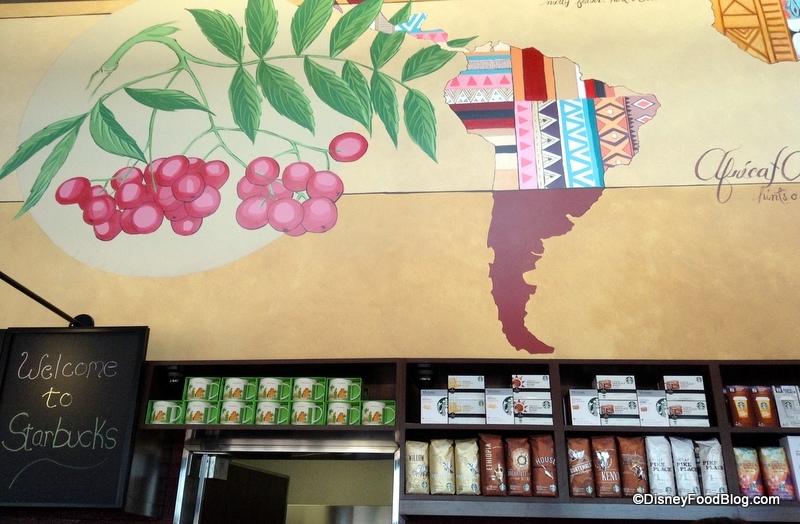 Do you know if we’ll be able to redeem Starbucks Rewards free drinks at this location? 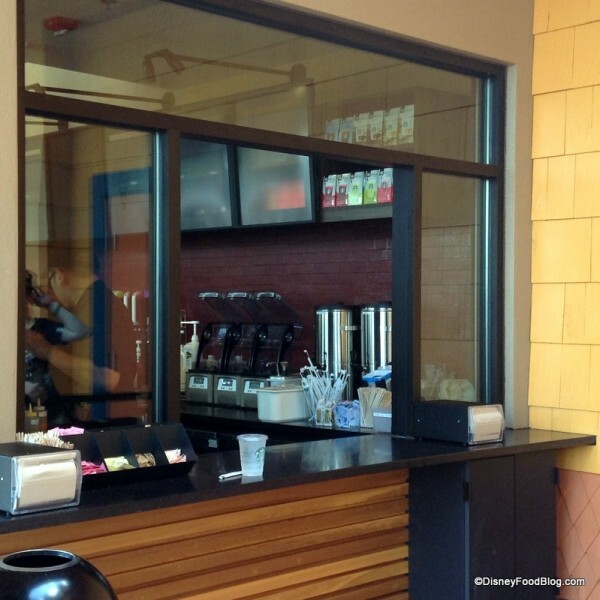 I’m pretty happy about this.. love starbucks coffee… and for those that say the “real world” stores shouldn’t be in Disney.. what about DTD in Disneyland? They have Sephora .. and what about House of Blues which is already at Westside? 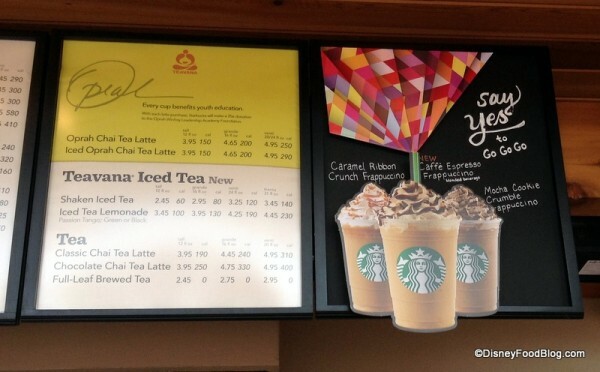 Anyway.. happy to see starbucks in a few more locations. 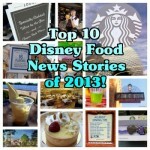 Do you know if they take Starbucks Gold cards or Gift cards? Do you know if we’ll be able to redeem Starbucks Rewards free drinks at this location? 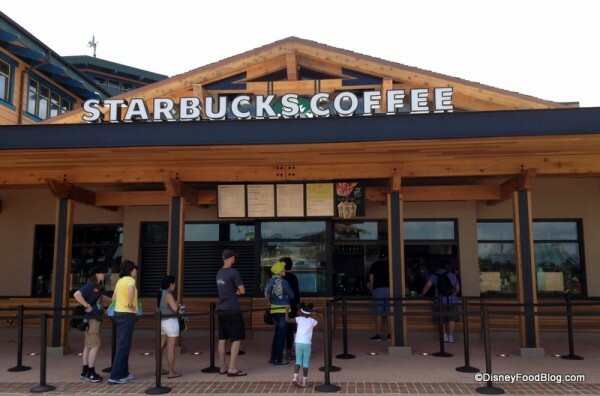 My husband was able to use his Starbucks card at this location yesterday, and also earned stars for his purchase. 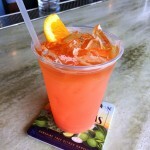 I’m not certain if you can redeem free drinks there, however… I’ll see what I can find out on my next trip :)! Dawn, that is true of the MK location :). 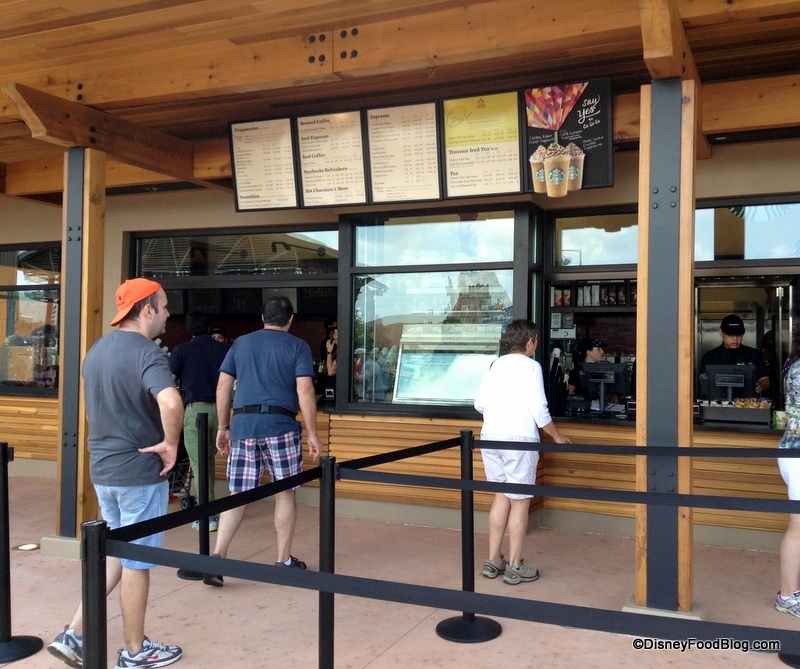 Currently, the beverages at Downtown Disney aren’t designated as snack credits, but we’ll be keeping an eye out to see if this changes. Marci – Ha!! 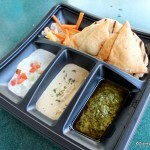 And YOU get a chai, as well ;)! I know people who work there and it’s a corporate Starbucks its not owned or operated by Disney so you should be able to redeem your free drinks and anything you would do at any corporate run Starbucks. 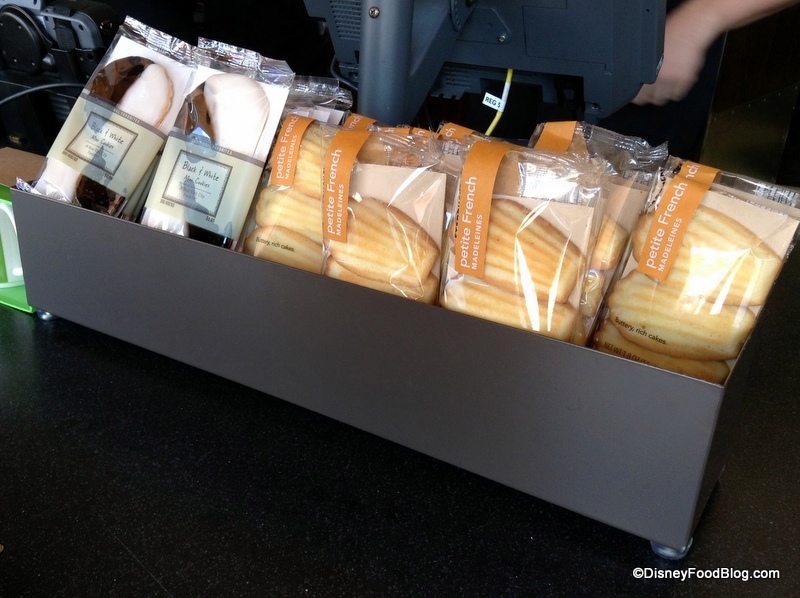 I’m thrilled that decent coffee is finally available at WDW. It was my one complaint. All those high end restaurants and not a decent cup of coffee to be found anywhere. Thanks so much!! What time does this Starbucks open? I always said, Mickey and Starbucks together…… what a magical union…. we love Mickey and our Starbucks….. 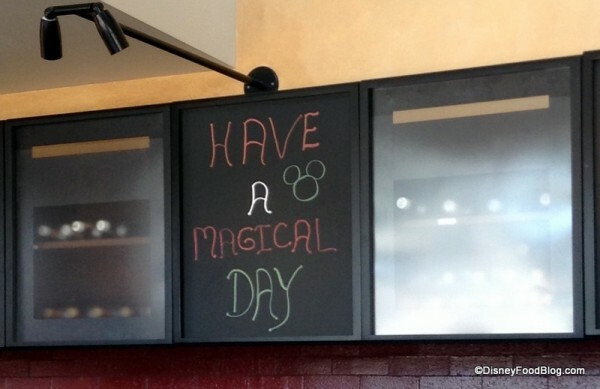 I have read that some people don’t like that Starbucks has come to WDW…and they have their opinions, but let’s not try to ruin it for people like us that love the concept of having two of your favorite things all in one place……Oh Happy Day!!!!!!! Love Me Some Frappacino !!!!!! THANKS DISNEY !! !